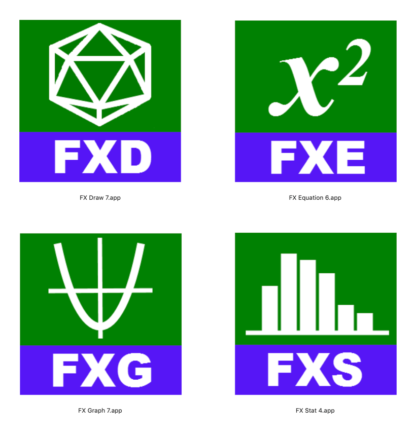 Efofex’s FX Draw Tools contains four of the most powerful and useful mathematical tools available for teachers and students. An FX Draw Tools subscription lets you use all of the products for one very low yearly rate. All FX Draw Tools products run on both the Windows and Mac platforms. You can download FX Draw Tools by clicking on the link below. These downloads contain fully functional copies of the four products that will run for thirty days. This allows you to fully evaluate the products’ features. If you decide to purchase a subscription we will send you an unlock code that will let you use the products for your subscription period. FX Draw and FX Equation were originally designed as tools for mathematics teachers but are now used by teachers and students all over the world. Together they provide a complete solution for the production of secondary level mathematical materials. FX Draw is not just a drawing program however. It can also be used to explore and demonstrate complex mathematical ideas. Used with a data projector, it can double as a mathematically enabled blackboard. FX Equation is a totally different way of entering equations. No other program can rival FX Equation’s easy, high speed creation of secondary mathematical equations. FX Equation is for anyone who gets frustrated with their current equation editor. FX Graph and FX Stat are primarily student tools for the exploration of functions, relations and statistics. “Intuitiveness” has been built into both products – but not at the expense of power. Students can start using both products with minimal training but will still be using the products in their last years of school. FX Graph is also a fantastic demonstration tool – especially when teamed with a data projector.